Jeeeyul’s Eclipse Themes 2.1.0 is released. 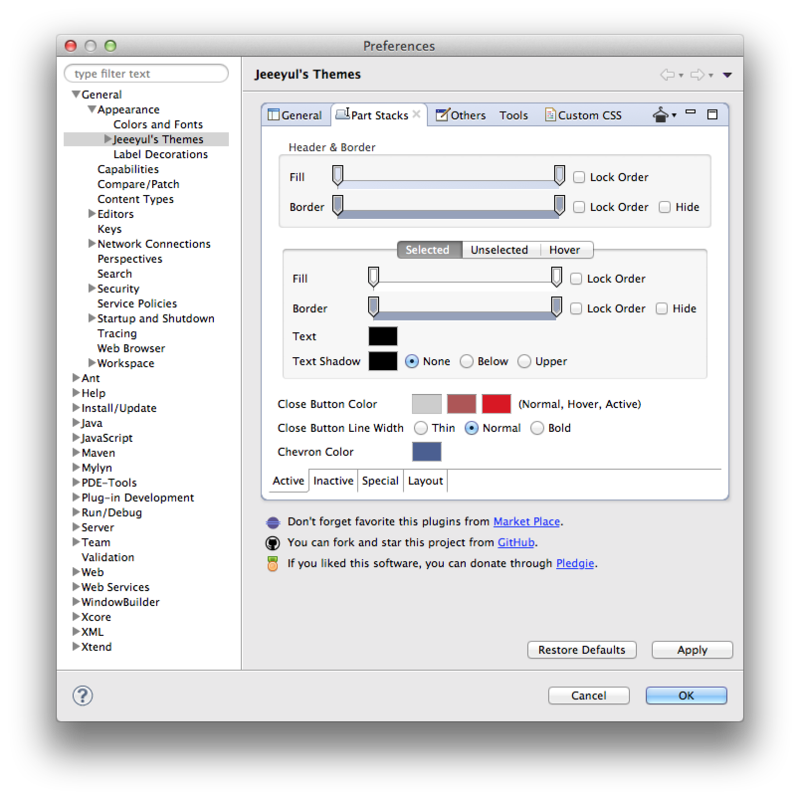 I am very glad to announce new Jeeeyul’s Eclipse Themes 2.1.0. Every single details are refined. Now you can customize complex gradient colors easily. You can customize chevron color , close button. You can customize tab items for “Selected”, “Unselected” and “Hovered” states. Various Layout Settings can be customized. Editor Stack and Empty Editor Stack can be customized. Visit https://github.com/jeeeyul/eclipse-themes and get details. Updated – I replace Demo with more rocks! I tried to let GEF uses JavaFX as a view. I began to make new GraphicalViewer and EditParts based on FX Scene Graph Node not Draw2d Figure. However it was failed because there are so much things have to be done to make it success(event dispatching, tool, hit testing, layering, feedback system, lots of edit policies….). It is not acceptable amount of task for individual experiments. Let JavaFX renders Draw2D figures. I can use advanced beautiful graphics with my custom figures. FXViewer : Modified Graphical Viewer to use FXLightweightSystem. It takes FXCanvas as control. Provides Canvas Scene Node as Graphics Source to UpdateManager. FXUpdateManager is almost same with DeferredUpdateManager except using GraphicsContext of javaFX. It helps lightweight system to render draw2d figures. FXGraphics is implementation of Draw2D Graphics. It is used by FXUpdateManager to redner. Since graphics capabilities of JavaFX is much richer than SWT, It was very easy task. Draw2D uses SWT Resources like as Color, Image, Font. So I have to dynamically translate them fit to JavaFX in runtime with FXGraphics. It loses some performance. And application will use GDI resources without point. JavaFX Canvas node has fixed rendering size. I can’t use JavaFX’s animation features on GEF editors since view is not based on JavaFX Scene Graph Node but just single Canvas Node. I think what if I had more resources(time and money! ), I will make new GraphicalViewer which has a Scene Graph based view. Because I want to provide super rich WYSIWYG environment using JavaFX’s capabilities not only just single Canvas Node. 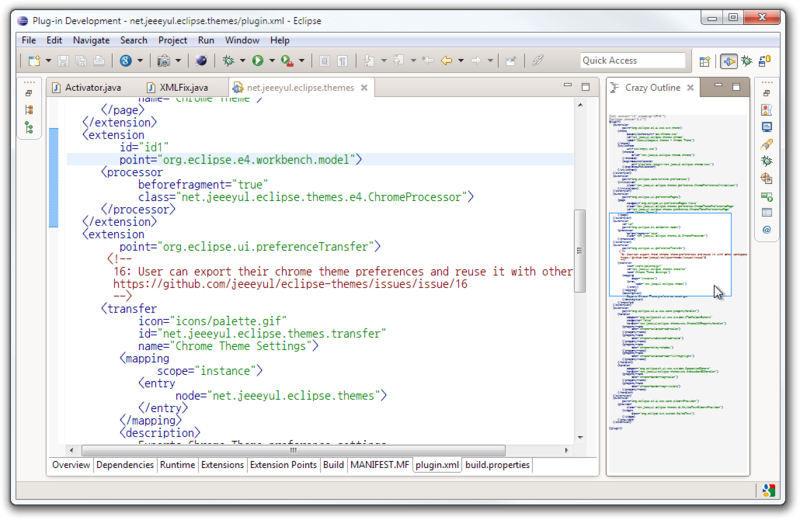 Java FX HTML Editor in Eclipse! I did not care about JavaFX, Because It did not support OSX, and there was no legal OSGi bundle for it. Now, JDK7 shipped with JavaFX, So there is no bundle problem anymore. JDK7 for OSX is also available now. And I heard that Oracle provides Embedding API for SWT. So I’v tried to make a HTML Editor for Eclipse using JavaFX. I could make a HTML WYSIWYG Edtior which supports HTML5/CSS3. Codes were unbelievably easy and short. See in HD to improve readability. I think we can use JavaFX Scene graph as a view of GEF too. It must be cool! It provides very high quality rendering results with performance. I will challenge this later. I began JAVA since 1995, And I loved Swing then SWT. Now I am a big fan of SWT since 2002. And I have some worries about SWT that I want to share with you. In early stage of Java, Standard UI for Java, AWT was very ugly and slow. There was a big war around Java UI. Primary topic in the war was Unified Experience VS Native Experience. All UI Objects in SWT are just proxies to OS’s UI Objects. So application looks very harmonious with their native OS because all UIs are actually native. It is why do we have to dispose SWT Resources and Widgets. In OSX, Buttons can’t take keyboard focus, So what if some wizard page contains only buttons, it can’t have context help. You have to test every platform what if you have choose SWT. Behavior of widgets are handled by Native OS, ex: expanding/collapsing tree. So it is very fast. SWT translates Native Events to SWT Events(Display#readAndDispatch), So developer can extend behavior of widgets using Java. JFace is most elegant and easy, and well designed library for UI. JFace provides awesome MVC patterns for SWT. So SWT can stay very simple and low-level. Most good experience of Eclipse Application are came with JFace. Swing is much more complex then SWT because there is nothing likes JFace. JFace is also good tutorial or guide about how to use SWT smart. It’s big heritage. Peer communication: Is it really fast? When you commit a command through SWT, SWT translate it and send to OS. OS will work what you ordered. What if amount of work is larger than cost of peer communication, It’s Okay. In other case, It’s not. In general, OS doing not much since almost controllers are written with Java in SWT. When you click the button, OS generate event, SWT will translate it and dispatch, Java Listener will do some job. AWT’s Peer communication uses same strategy, buy it is very buggy and slow because they tried to accomplish Write Once Run Everywhere. So communications costs much than SWT. But, Natives are natives, differents are differents. So it was failed. It fills red pixels into a 640*480 image using SWT. It costs more then 2000 milliseconds! Because Line 12 cause Peer Communication 307,200 times! It costs about 300 milliseconds now. They are semantically same task but peer communications are reduced. There was a big difference in performance. Someone may think first example is too inefficient to compare, see next. This codes are exactly same with first example except there is no peer communication since PaletteData, RGB and ImageData are pure java objects. It costs only 193 milliseconds. And this code can be executed in Non-UI thread. So we don’t have to block UI when we create images. Number of peer communications are increased as count of tree items. It’s a reason for that why TreeViewer#refresh() is so slow. In this case, We can use Deferred Update Strategy, Lazy Content Providing or Virtual FLAG to improve performance. But these techniques are pretty tough to developers. In these days, Swing is super fast since it uses GPU. Native performance is not important anymore since native behavior is tend to be smaller than actual business task or rendering codes. And almost machine has it’s own GPU. For instance, GEF needs to manipulate very complex UI without Peer Cost, So they developed Draw2d(light-weight, Pure Java UI Library which is rendered on FigureCanvas). So we can use various UIs without loosing performance in GEF Editors. Figures in Draw2D are almost same with Swing. Swing UIs are rendered by JVM, Figures in Draw2d are rendered by FigureCanvas(LightWeightSystem). So there are no peer cost. For same purpose, Nebula provides some widgets like Grid. It can takes massive amount of model and massive number of UI elements. SWT is fast? Yes! and No!! You have to care about peer communication to make your application support massive scale. System.out.println() is very strong and useful debug tool for long time. The problem is that we tend to don’t remove this code after we debug. What if do we have a lots of codes which we forgot to remove, finally debug messages can be useless trashes. But tracing location of println() code is very difficult since we can’t use break points on system console stream. Just call DebugStream.activate() when your application start. 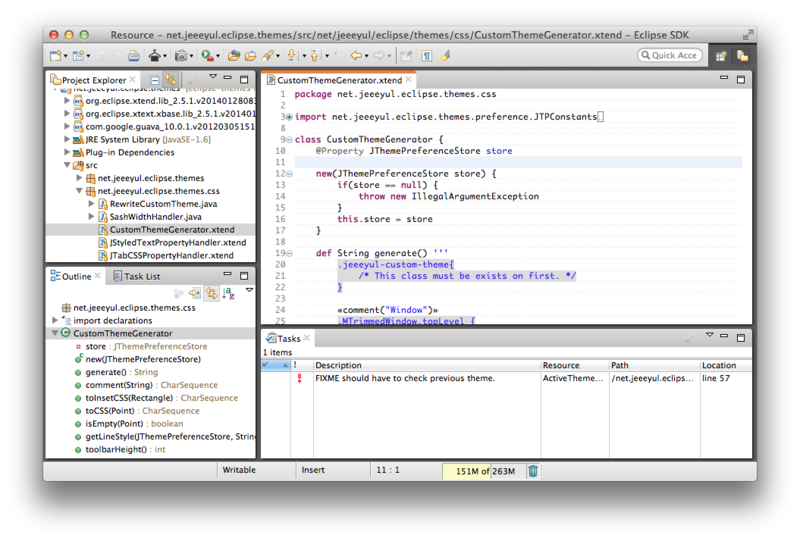 Yes, you can click and jump to your System.out.println() code in Eclipse console view. It makes debugging so easy. 이 문서는 한국어 버전이 제공됩니다. I developed commercial Eclipse plugins for 5 years. With this experiences, I made a tools which helps Eclipse Plugin Developers for me and my team. And I call it “PDE-Tools“, And I love to share this tool to you. Just press Control + Shift + V instead of Control + V, then you can paste contents from history of Clipboard. It supports RTF contents, and It also provides view which supports DND. You can customize various options(sort order, acceptance style). It’s pretty insightful function. It just allows to you see icons with your favorite navigator. It’s fast and light-weight, content change sensitive. This is my favorite feature of PDE-Tools. It generates SharedImages class with given monitored folder. It also supports structural palette according to sub folders. Select a plugin project, and press right mouse button. 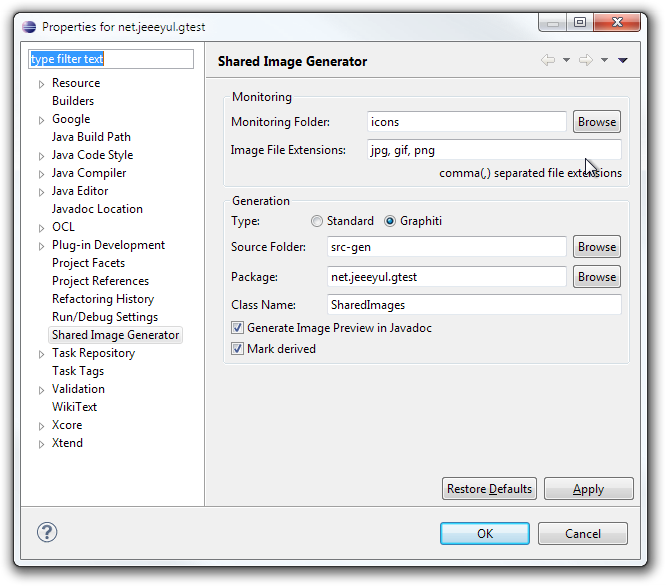 It also generates icon preview in Java doc, and it also supports Graphiti Image Provider, Re-factoring. 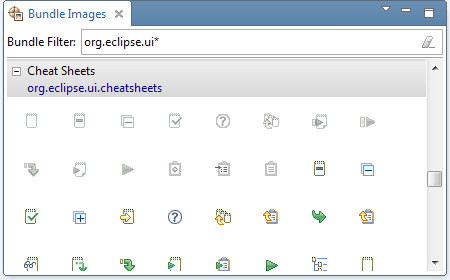 Bundle Image View lets you can re-use eclipse image resources. Just drag them into your project. This feature is very useful to OSX users. It adds “Launch Workspace” menu below “Switch Workspace”. So you can easily launch another workspace without quitting current one. This cute crazy view provides insightful way to navigate source code. You can find small camera on toolbar, It allows you to capture part or toolbar easily. With Ctrl(or command) key, you can capture entire shell with Shadow. type “Jeeeyul” into search field. 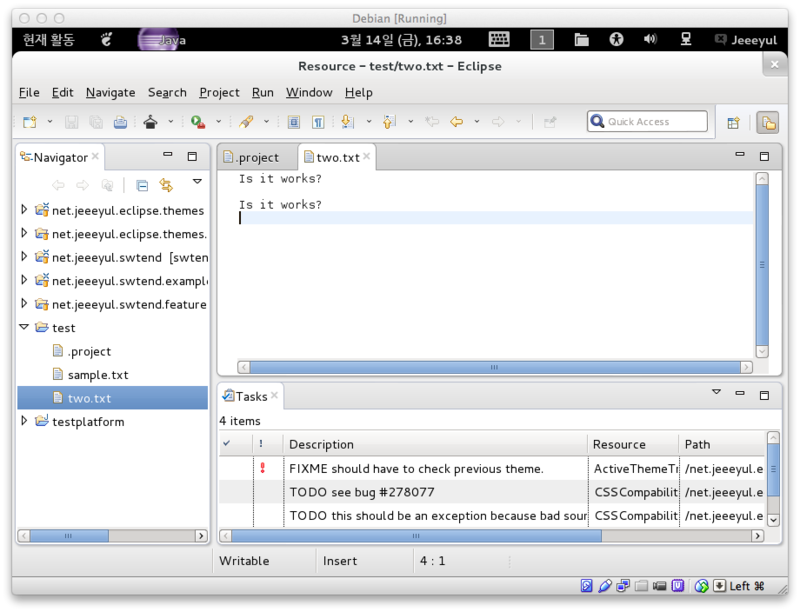 I created an alternative theme for Eclipse Juno 3 months ago, Now it supports Juno SR1 fully. You can customize very many things in lightweight. Inelegant drag handle for perspective switcher is removed. Much more harmonious drag handles with your configuration. Space next to Quick Access has integrated under line. See more from project page on github. Inelegant image stretching for drag handle was removed.